Bright colors intertwined with VHS-quality and other psychedelic enjoyment. Together with the technology of yesteryear, Roladex have done good in their homage to where their influences come from. With their 80’s-infused synth-pop sound and their carefully executed visual FX create a hypnotic atmosphere which is almost exclusive to music-videos from that decade and before the 2000’s. You will find no polished turds á la big business labels and their PR-menagerie here. Not to mention their song “Glass Statuette” on their newly released split with ((PRESSURES)), which is saturated with the mesmerizing duo’s eloquent vocals whose delivery hypnotize you, as the spastic arpeggio rhythm continually rolls in the foreground – an aquatic melody seduces you. You can’t help but start humming the lyrics in a repetitive fashion. I also think the video captures a bizarre vein that Roladex don’t capture as well with their music, which seems to me when I listen to it to be in all seriousness, but the video itself adds that tongue-in-cheek vibe that music-videos used to give. Either because they were abhorrent in their silliness, or simply delivering a positive nerve in the musical delivery – which in Roladex’s case is true – as you also can’t help but smile. It would’ve been great if this split-release could’ve featured a music-video by ((PRESSURES)), too. Because then it would’ve been more than two songs that you keep on the repeat. But with that said, I think the track “The Voices” complements “Glass Statuette” very well. 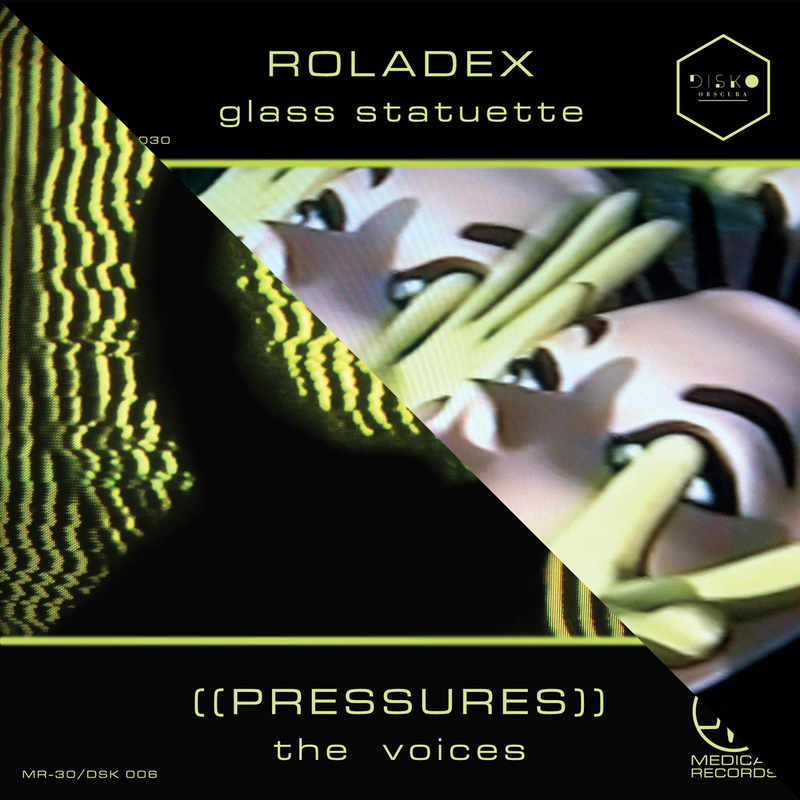 I think ((PRESSURES)) are the ones whom deliver the futuristic touch to this release, as the B-Side coincides with Roladex’s passionate nostalgic reflections both in track and video. “The Voices” almost touch cold-wave territory, but instead of going into the coldness and reflections of that – there’s a clear disco-vibe to the whole she-bang. With vocals that soothe your soul, together with a steadfast drum-machine rhythm and cosmic synthesizers – I would say that the A-Side gives more hope for us in the future. Though a lot of melancholy can be heard in both tracks, the bleaker side is when Roladex comes on, but I’m not sure anymore after having seen their music-video. All of this might be my hypnotized me talking, but they’ve charmed me with their other side of the coin. Both tracks are complementary as I’ve said, but one wouldn’t stand with the other and they display different characteristics. I just wish they would’ve included the music-video with the release and also made a music-video for ((PRESSURES)) track. That way, their likeness and difference could’ve been visually represented as well as musically. Since this is a joint release by Medical Records and Disko Obscura, you can either choose to order the limited edition 7¨ in thick transparent yellow, or transparent urochrome vinyl. It’s your choice whether you’d like to go with Medical Records or Disko Obscura, but they both have their unique take on it and if you’re a collector then you should go for them both. You can order the transparent yellow version here, and the transparent urochrome here. Stream both tracks digitally down below and watch the music-video above.